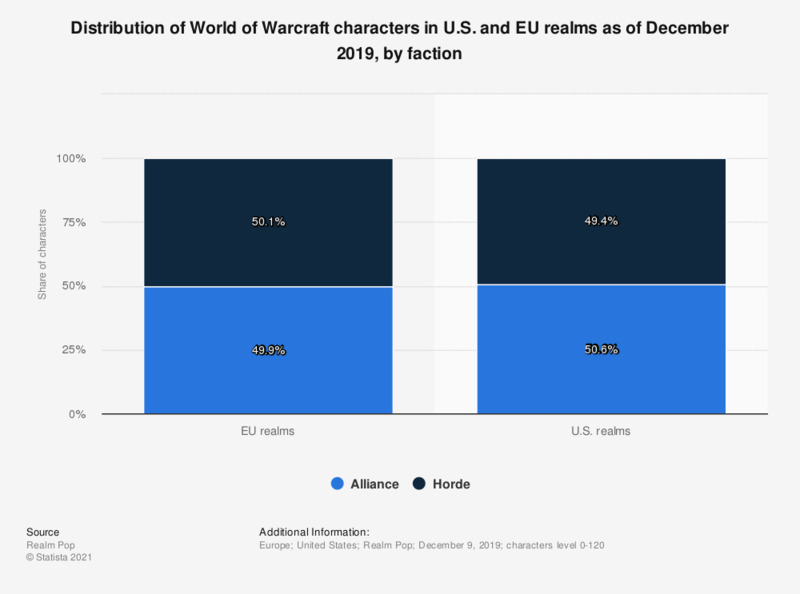 The statistic shows the distribution of characters by faction in the online computer game World of Warcraft as of February 1, 2019. Approximately 50.9 percent of all characters in the U.S. realms were members of the Alliance. In the beginning, when a player generates an avatar for himself they need to choose a race. Depending on their race, they further need to choose a class for their avatar. Factions are automatically assigned based on chosen race. Each race and class contain certain talents which they develop throughout the game; for example, an undead death knight may have increased physical strength and a talent in summoning undead creatures, such as demons. As of February 2019, the most popular races in U.S. realms were humans and blood elves and the most popular classes were hunters and paladins.